COMING SOON! 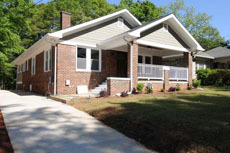 This is a single-family home located at 406 Mimosa Drive, Decatur GA. 406 Mimosa Dr has 3 beds, 2 baths, and approximately 1,996 square feet. The property was built in 1948. The home is currently being renovated by Pennylane Properties, LLC. Purchase a house from a registered/accredited investment company with licensed professionals on staff. With over 10 years of experience and an A+ rating with the Better Business Bureau, you’ll be treated fairly and the paperwork properly.